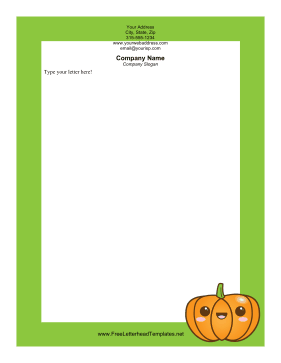 A cute cartoon pumpkin smiles on the green border of this Halloween letterhead. These free letterhead templates are easy to download, customize, and print. These letterhead templates are available in Microsoft Word (.DOC) format. Just download a template, open it in Microsoft Word (or any other program that can read DOC documents), edit the template, and print it. If you don't see a letterhead design or category that you want, please take a moment to let us know what you are looking for.